Maps for exploring MDI and Acadia. Most are printable, many are available from Chamber businesses and all from the Visitor Center. The Chamber prints an up-to-date map of hiking and cycling trails on the Quietside. The map also includes tide tables for Southwest Harbor, the time of sunrise and sunset, and the current phase of the moon. 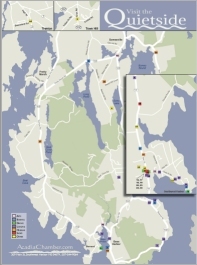 The Chamber also publishes the definitive map of Acadia's carriage roads showing all the intersections and bridges. On the back are elevation profiles for each road that you can use to gauge the difficulty of a route. The map is available from the Chamber office and Chamber businesses. 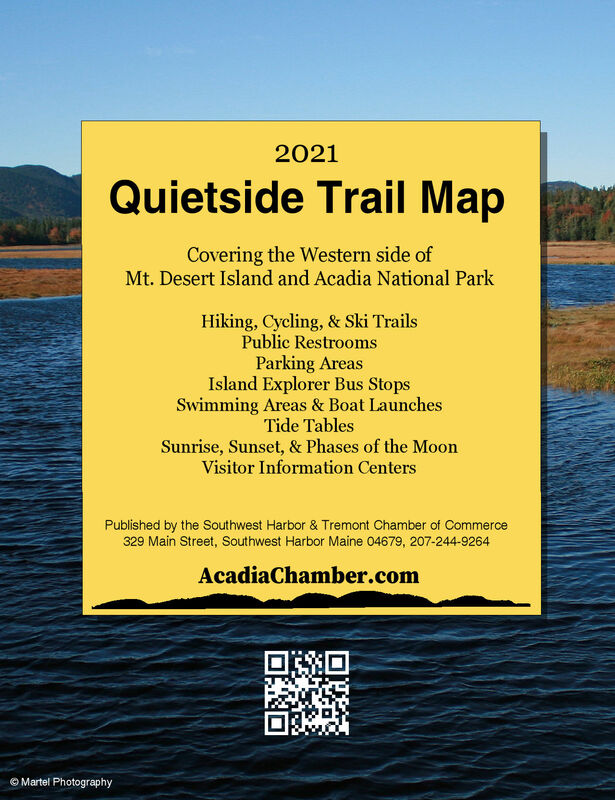 Highlighting the cultural institutions on the Quietside of MDI, the Quietside Roadmap is a convenient resource for finding things to do and places to eat, shop and stay. Pick one up at most museums and visitor centers. The "official" map of Acadia, published by the Park Service, gives a good overview of the park. It is fine for driving, but for hiking or cycling it is better to use a more detailed map like the Quietside Trail Map, the Carriage Road Map, or a specialized guidebook. Widely used and distributed around the island, the Business Locator puts a good road map of MDI in a compact form. It shows the location of many island businesses. As there are no major cities on the downeast coast of Maine, MDI is a great place for observing the night sky. The Quietside turns out also to be the dark side. Two College of the Atlantic students, Nicholas Bacon and Apoorv Ghelot, working with the Astronomy Institute of Maine and COA's GIS Lab, created this map showing the amount of ambient light at night. A printable street map for downtown Southwest Harbor. Frenchboro and Long Island Get it! Isle au Haut Get it!